I miss vineyards, wineries and getting my hands dirty. Ever since I returned to Hong Kong I have tried to do a vintage somewhere every year, but it’s not easy as harvests in either hemisphere are usually the busiest months in Hong Kong (mid February to early May, and early September to end of October). There are also legalities (work permits, insurance - especially in China wineries), and reservations from wineries (why should they take on a Hong Kong girl who may just want to be babysat and entertained). 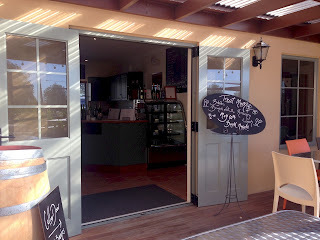 Therefore, when Unison Vineyard, the smallest estate in Gimblett Gravels in New Zealand with only 6 ha of vines, agreed to take me, I jumped at the chance even though it meant I would be away for more than two weeks in between two of my major projects: Discover South African Wine and Riesling Weeks. It was tough as it was on average a 9-hour day with no day off at the winery and 6 hour working at night on the Hong Kong projects with a slow internet connection (hey, I was in a rural area). Still I loved every single moment of it. 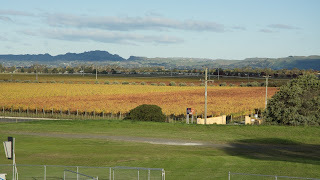 After all, Gimblett Gravels is one of my two favourite wine regions in New Zealand (the other is Martinborough). I don’t like working in big wineries as it often means repetitive work on one aspect for the whole period. I used to work at a medium sized winery in Portugal and at one point I did only pumping-over for 5 consecutive days. 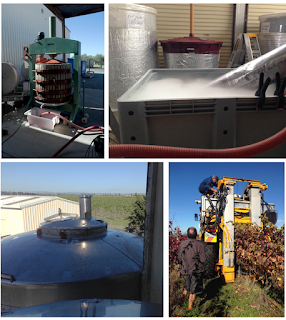 Winery work is physically demanding and big wineries even more so—a pump can easily weighs more than me. In contrast, small wineries are all hands-on and you need to get involved with everything. 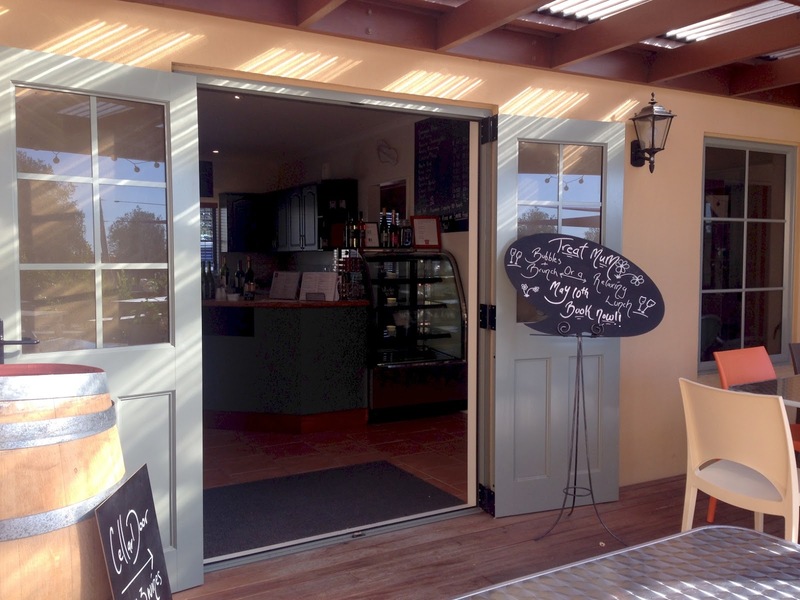 Plus it gives the chance to talk to owners, family members, winemakers, cellar hands, vineyard workers and sometimes even customers. Not only do I improve my technical knowledge but I also get to understand the philosophy behind the labels better. Unison’s team is small: only Philip the winemaker/owner, Phil the vineyard manager who also helps at the winery, and Jenny Dobson, the winemaker consultant. Everyone shares work—from picking, rehydrating yeast and punching down to bottling and cleaning (the most important task in every winery). Although not in the right order, because the Merlot had all been picked when I arrived while Syrah and Cabernet Sauvignon were only picked a few days afterwards, I managed to work in nearly every task of a winery, from picking to bottling, except blending and putting wine into barrels. There were also a few things new to me: making rosé by the saignee method, machine harvesting, using an ancient basket press, and fermenting Italian grapes in New Zealand—Unison doesn’t grow white varieties but they help make the neighbour’s Fiano. My most favourite jobs were monitoring all the ferments every day (satisfying to see the progress), climbing to the top of the tanks to do pump over (the best view in any winery), tasting the ferments with Jenny every day (great learning opportunity), and clearing water using the floor squeegee (like medication). The Gimblett Gravels region is small, only some 800 ha under vines compared to over 20,000 ha in Marlborough. It was created when the Ngaruroro River changed course in 1867, leaving greywacke—a mixture of stones, gravels and sand—behind. Because of its unique free draining gravelly soil, temperate climate and long growing season, the region can make elegant red wine with ripe fruits without heaviness. Great examples are the Merlot with vibrant red fruits instead of chocolate and distinctive white peppery Syrah. 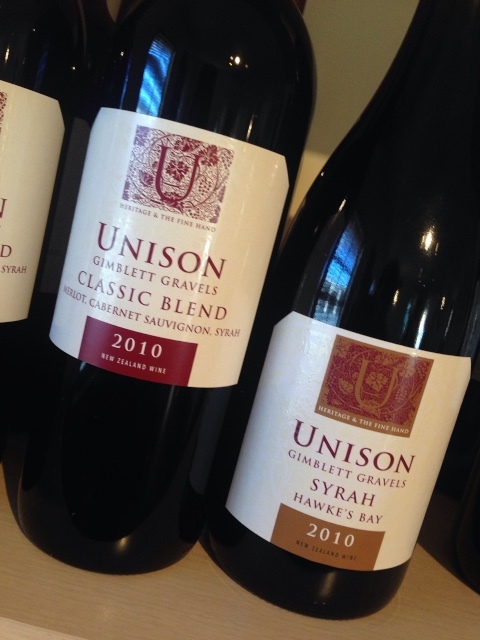 It is because of this that the wineries got together to found the Gimblett Gravels Winegrowers Association in 2001 to differentiate themselves from the rest of the larger Hawkes Bay region. According to the Association it is probably the first viticultural appellation in the New World whose ultimate boundary is defined by a distinct soil type boundary: no compromises, no politics. Unison wine is typical of Gimblett Gravels but with an added touch of refinement, probably because of the extra attention paid to the vines by Philip and Phil, as well as the dedication and vision of Jenny (she spent nearly 20 years in France and is one of the few consultants that I have come across who checks the wine every day during vintage). Philip was very kind to give me a different bottle of Unison's wine to try every day after work, even the very first vintage of its Selection 2009, a blend of Cabernet and Merlot. I particularly like the winery's elegant Syrah. The Sancerre-like Sauvignon Blanc made with grapes bought form Hawkes Bay was a nice surprise and very different from the Marlborough Sauvignon Blancs. It was perfect with the Vietnamese dinner I had in Auckland after the vintage. One more surprise during vintage—the 2006 Te Awa Pinotage from Hawkes Bay made by Jenny. It was more towards Pinot Noir, but with higher tannin, and quite similar to Southern Right Pinotage from Hermanus. Apparently, New Zealand has been making Pinotage for 40 years but it is not as fashionable now as it once was. Even Te Awa is not making it anymore. Wikipedia says there is only 38ha of Pinotage in New Zealand. It's something a bit special. Try one if you get the chance. Working at Unison was a good experience. I wish everyone there all the best in the coming vintages. Thanks again Terry and Philip, the owners, who gave me the opportunity, Jenny and Charles who hosted me at their place, Phil who shared both the dirty work and the cleaning with me, Paul and Calsey from Unison’s Unwind Cafe who fed me and fixed my caffeine craving, and Nick from Mills Reef who made the initial connection. Unison Wine is not available in Hong Kong yet but is available in Shanghai from Vino Maestro. Asked about their favourite wines, 90% of wine lovers, including myself, will name Burgundy—or more specifically, the Chardonnays and Pinot Noirs from Côte d’Or—as one of the top three. However these wines can be very confusing. So I was glad to have spent two afternoons in quick succession with experts, learning about what makes Burgundy tick. Jasper Morris MW, Burgundy Director of Berry Bros & Rudd, and the author of ‘Inside Burgundy’, is well known for his expertise and passion for all things Burgundian. On his recent visit to Asia, we explored the three Ws in Côte d’Or— where, when and who —by tasting three pairs of wines, each pair having two Ws in common and one different. A similar exercise was conducted just a week later at the Altaya Wines annual ‘Passion for Pinot’ seminar, this time with owners from four family-run Burgundy wineries sharing their insights into the three Ws through 12 wines. Burgundy wine is classified into four levels of quality: Regional appellations make up 52% of the total production, Village appellations 36% and Premier Crus (1er Crus) 10%. The remaining 2% belongs to the Grand Crus. The latter two levels are based on climats, small, precisely delineated plots of land that enjoy specific geological and climatic conditions. Côte d’Or, a long and narrow strip, is the heartland of Burgundy where the greatest wines are made. It is split into Côte de Nuits in the north and Côte de Beaune in the south. 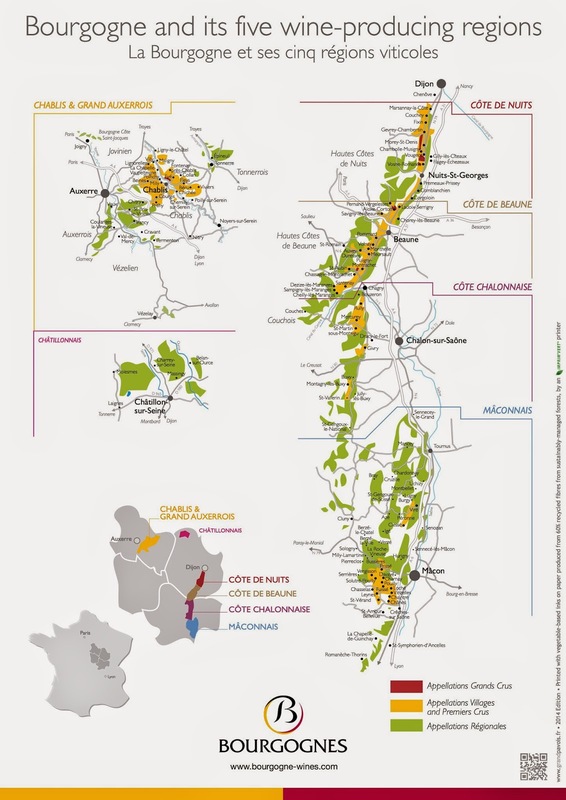 Some 30 of the 44 Village appellations and hundreds of climats are found here, as well as 28 of the 33 Grand Crus AOC. The soil in Côte d’Or is predominantly limestone and marl, but each village has a different combination. Pascal and Charles Lachaux, a father and son team from Domaine Arnounx-Lachaux, explained that the different characters of their three reds—all from the same vintage of 2011 and made exactly the same way but from different villages—are due to the soil and location. 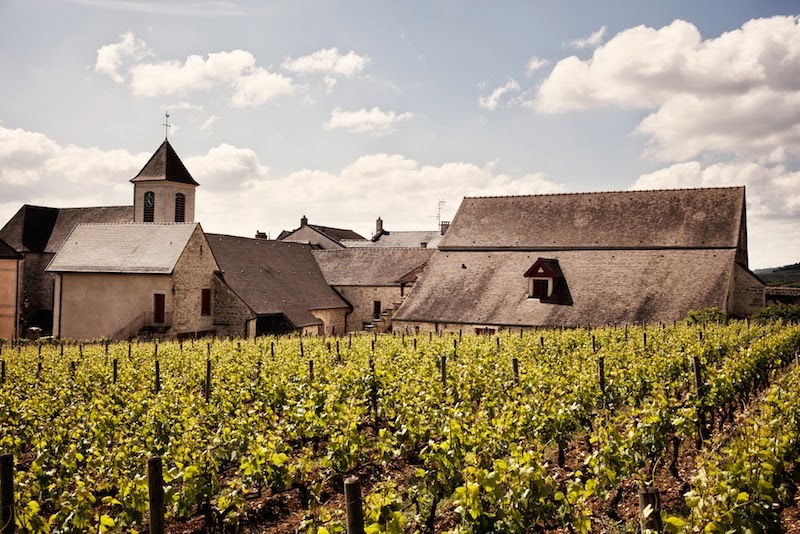 Chambolle Musigny, further north with white soil, produces lighter and softer wine, while Vosne Romanée’s darker soil gives more structure and power to the wine. The third wine is from Nuits St Georges but it is not in the typical rich style thanks to the very white soil that results in smaller grapes. The wine is concentrated yet elegant. Another interesting comparison was the two 1er Crus from Domaine Faiveley. Both were from Gevrey Chambertin, vintage 2012 and the same winemaking method. The ‘Clos des Issarts’ has a marked mineral palate with a smooth finish while the ‘Combe aux Moines’ is more tannic and muscular. The two climats are less than two kilometres from each other! ‘When’ refers to vintage. 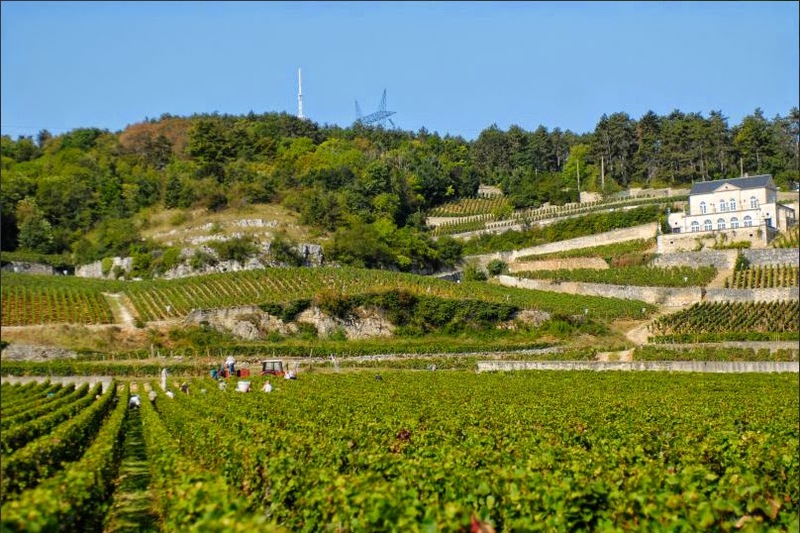 According to Jasper, Burgundy is a crossroads for weather and is often at the cusp of two weather systems. No wonder every vintage in Burgundy is different. Frost and hail reduce crop yield while rain during ripening season affects quality. A hot summer gives powerful wine but too hot may result in imbalance between acidity and alcohol. A cool year, on the other hand, may produce wine that is too thin although diligent winemakers can still make some very elegant wine. Jasper’s philosophy is that vintages should not be classified as good or bad, but rather, an indication of when to drink the wine. With Jasper, we compared the 2003 and 2000 reds from Domaine Jean Grivot Nuits-Georges 1er Cru ‘Roncieres’. The 2003 was rich and concentrated reflecting the particularly hot year, but it was still youthful with ripe dark fruits at 12 years of age. The 2000, although only three years older than the 2003, was much more advanced with dried fruits and forest floor bouquets. It was a more difficult vintage with too much rainfall close to harvest. Jasper described 2000 as a cheerful vintage for wine lovers—while it is not a long-lived vintage, the price is reasonable and the wine absolutely enjoyable now. The 2003, in contrast, still has at least another five years before its peak. The notion of terroir is the interaction between soil, climate and people, so obviously winemakers play an important role in shaping the style of the wine. This was well demonstrated by BBR’s pair of 2008 Vosne-Romanèe 1er Cru ‘Les Beaux Monts’, Domaine Bruno Clavelier and Domaine Jean Grivot. The grapes of the first wine were picked slightly early and vinified with some stems. The wine displayed vibrant red fruits and floral notes yet with a fairly dense structure. The second wine had no stems used during winemaking but was aged in barrels for 18 months. It showed riper red fruits but with a leaner palate. We also contrasted three reds at the Passion for Pinot session: Domaine de Montille Volnay 1er Cru ‘Les Mitans’ 2009, Domaine Faiveley Pommard 1er Cru ‘Les Rugiens’ 2012 and Bonneau du Martray Corton 2011. Although they were from different vineyards and vintages, we could still see the fingerprints of the different winemakers in the wine by the way they managed tannin and extraction. These two tastings confirmed my belief that our choice of wine is personal. Wine is not about price or ratings. We all have different palates and stylistic preferences so it is only logical that we do not all prefer the same wine. As for vintage, well, we just have to buy every year and enjoy them at different times! 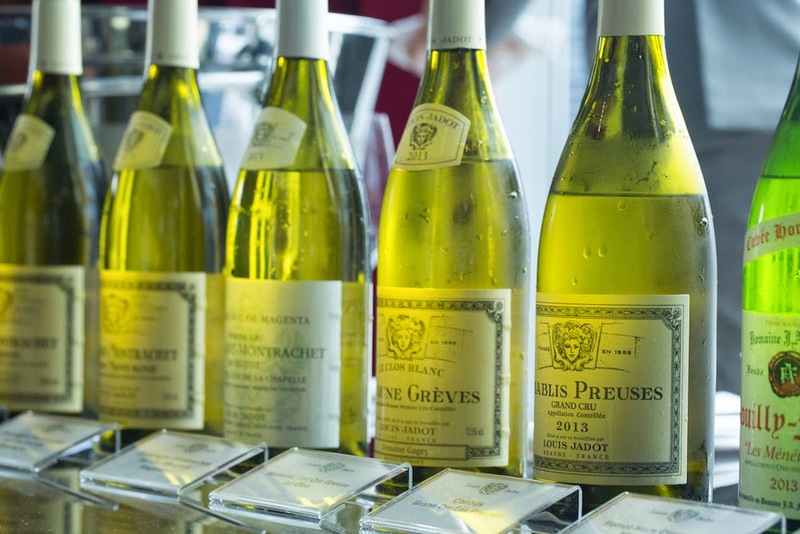 I also had the chance to taste the Louis Jadot 2013 en primeur organised by ASC Fine Wines. Louis Jadot is one of the larger producers in Burgundy with vineyards in nearly every Côte d’Or village. Thibault Gegey, its Deputy General Manager, explained that 2013 was a difficult year. Spring was wet and cold, resulting in poor flowering and thus a smaller crop. Summer finally arrived in June but a hailstorm in July devastated some vineyards between Meursault and Aloxe-Corton. September, the most important month for grape ripening, was excellent and balanced fruit with good potential began to develop, albeit in a much smaller crop. Unfortunately though, the weather turned progressively wetter and colder so those grapes harvested later had more rot than those harvested earlier. Armed with knowledge of the three Ws, I would certainly not dismiss the 2013 vintage. It doesn’t taste like 2010 and probably doesn’t have the same ageing potential, but so what? I love its elegance and leaner style, and I’m sure I’m not the only one. When we sip a Burgundy, we know we are tasting the dedication of vinegrowers and wienmakers who care about their climats, and try to make the best possible Chardonnays and Pinot Noirs in every weather condition. Enjoy! Domaine Bruno Clavelier, Domaine Jean Grivot are available from Berry Bros & Rudd. Domaine Arnounx-Lachaux, Domaine Faiveley, Domaine de Montille, Bonneau du Martray are available from Altaya Wines.